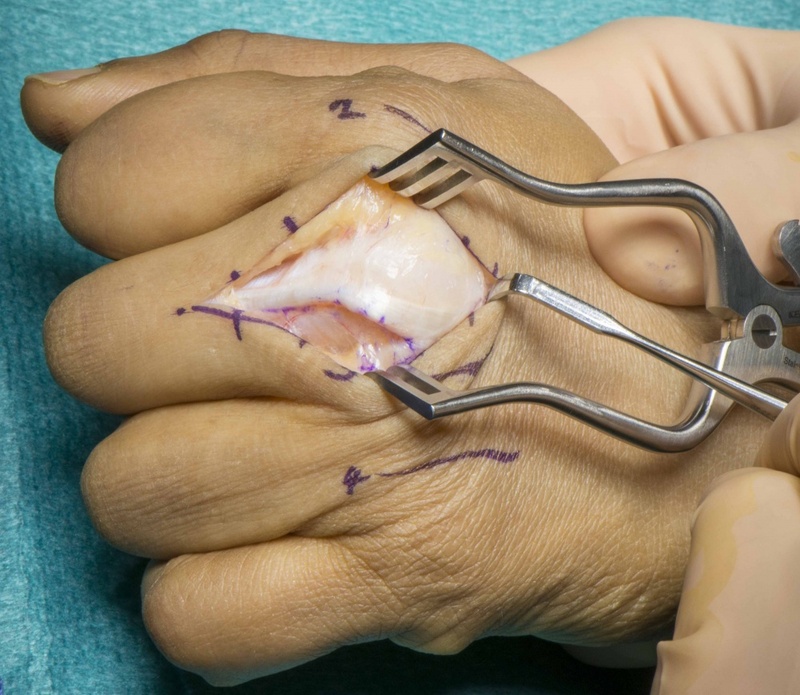 Learn the Sagittal band reconstruction (Middle finger) surgical technique with step by step instructions on OrthOracle. Our e-learning platform contains high resolution images and a certified CME of the Sagittal band reconstruction (Middle finger) surgical procedure. This is a detailed step by step instruction through a Middle finger Sagittal band reconstruction using a central segment of the extensor apparatus to realign and hold the extensor tendon in place during metacarpo-phalangeal joint (MCPJ) flexion. It is performed through a dorsal midline approach. This method is a modification of that published by Charles Carroll in 1987 (see results section). This is a procedure performed when the sagittal band, usually the radial sided band, ruptures. This is most commonly as a result of inflammatory arthritis but may also be required in neglected traumatic ruptures where a primary repair is not possible. The procedure can be performed as a day case under regional or general anaesthetic and takes around 1 hour. Following a period of 1 week in plaster cast the patient then starts mobilisation with active flexion and extension and a volar based splint which limits MCPJ flexion to 30 degrees for 2 weeks, 60 degrees for 2 weeks then 90 degree for the final 2 weeks. The joint will always appear swollen however the majority of post operative swelling will resolve by 3 months.